Anfield is no strange place for me, as I normally work in one of the bars in the ground on matchday, but on this night I would be visiting the stadium for a much more exciting reason. 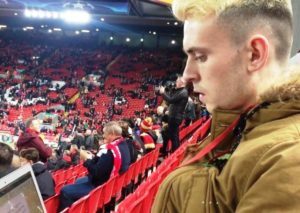 Alongside fellow sports journalism student, Oli Fell, I was lucky enough to be selected to sit in the press box and get a behind-the-scenes glance at what reporters face at the Liverpool v Maribor UEFA Champions League game. After a quick tour of the media facilities from JMU Journalism graduate, Chris Shaw, who now works full-time on the official Liverpool FC website, we got down to business, mingling with the professionals. Having been tasked with putting together a video, as well as live tweets and writing a report, we did few a pre-match pieces to camera and made a head-start on editing our clips. We then took our seats, and the famous atmosphere of an Anfield European night hit us. You will struggle to find anyone who doesn’t get goosebumps when You’ll Never Walk Alone echoes around Anfield, with the 2,500 travelling Maribor fans playing their part in adding to the sense of occasion. As the sound levels dipped, it was surprising to be able to hear the Liverpool players yell, swear and encourage each other, even from the media area. The eccentric Maribor manager, Darko Milanic, could be seen and heard roaring at his team from the sidelines – the type of thing you don’t pick up on when watching live on TV. “Bring on yer Internazionale” sang the Kop, but unfortunately for the Slovenian visitors they weren’t quite at the standard of Inter Milan. Despite it being goalless at the break, it seemed only a matter of time before the five-times European champions would take the lead. With Liverpool’s first attack of the second half, Alexander-Arnold’s fizzed cross was flicked on and into the net by Mo Salah for the summer signing’s 10th goal of the season. The crowd had been a bit flat before this, and as they burst into life it was tempting to join in, but it was important I kept my professional head on and got straight to work reporting what had just happened. 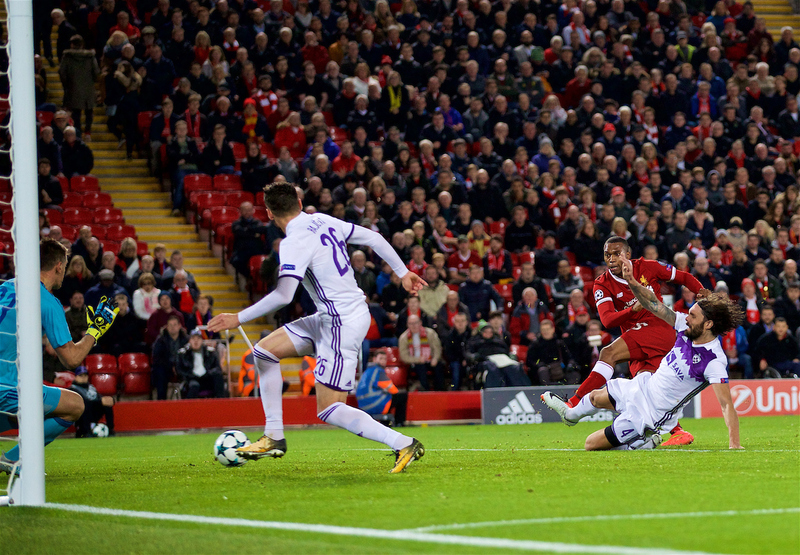 Only seconds later, it looked as if the Reds would go further ahead, but Jasmin Handanovic produced a brilliant save to deny James Milner from the penalty spot, and it was becoming increasingly difficult to juggle my duties. I was rushing between recording video, tweeting and typing up my article, with spelling mistakes creeping into my tweets as the pressure grew. Emre Can then finished off a flowing move to eventually double the lead on 64 minutes. Despite the fact we have always been warned of late goals ruining our reports, thankfully Daniel Sturridge’s injury-time finish wasn’t too difficult to squeeze into our final story. With the written piece out of the way, backstage we had a decision to make to either attend the manager press conferences or head straight for the mixed zone, as both would take place at the same time. We opted for the latter, hopeful of getting a first-hand interview, or discreetly attaching ourselves to an experienced journalist to grab a few second-hand quotes. However, aside from a brief “hi there” from Jurgen Klopp, it seemed hardly anybody was in luck because not even the regular reporters could get a word out of most of the squad. Regardless, it was an eye-opening experience, learning the post-match routine and hearing some gossip. I’ll return as one of the many inside Anfield for Liverpool’s remaining Champions League games this season, but unfortunately it will be back to pulling pints rather than writing reports.